Ultra slim and High quality music - Able to listen to surrounding noise. 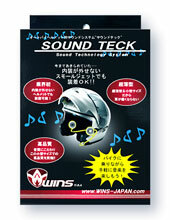 Head phone speaker for motorcycle use. It does it all! Music player, cell-phone, car navigation and wireless communicator High efficient speaker. Adaptable to the helmets which you can take interior off. So slim, So small. Its comfortable, does not hurt your ears. 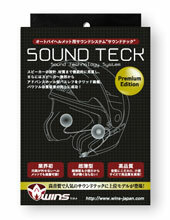 A higher model of the Sound Teck System which equipped new material on the trembler. Improved sound quality with new electromagnetic coils and magnet. Copyright WINS All rights reserved.